I was disappointed with Catching Hell, the Steve Bartman documentary that aired on ESPN. For one, it didn’t focus exclusively on Bartman and spent a excessive amount of time profiling Bill Buckner. Yes, he and Bartman were both baseball scapegoats but in very different contexts. The movie was long enough as it is. 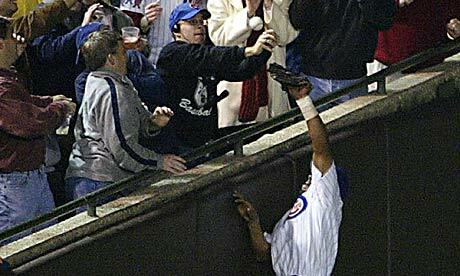 With that said, the coverage surrounding Bartman was fantastic and interesting. Although we still don’t really have a clue what he’s up to, everything from the play to the few days after was really insightful and the new footage from that night is amazing. Bartman really doesn’t deserve to be in exile for what happened, but I’m also sick of people defending him. “He was just doing what anyone would have done.” No, if you’re a real baseball fan sitting in the first row, you have to be aware of the game action and help your team, whether it’s Game 37 in May or Game 6 of the motherfucking Championship Series. That’s unacceptable as a sports fan. Unacceptable. Alou certainly would have made the catch. If I’m in that spot, not only am I moving as far away from the ball as possible but I’m keeping all the jabronis around me from touching the ball (and it wasn’t just Bartman going for it). The Cubs were five outs away from the World Series! It amazes me that people would care so much about a stupid ball that they would forget the situation. Now Bartman can’t even use a credit card. The funny thing is that he made such a perfect scapegoat because he was such a nerd with his glasses and turtleneck and made such a lame play at the ball. It was like he had cystic fibrosis or something. If he was some gregarious guy who drunkenly knocked the ball away and laughed about it afterwards, I doubt we’d still remember his name.